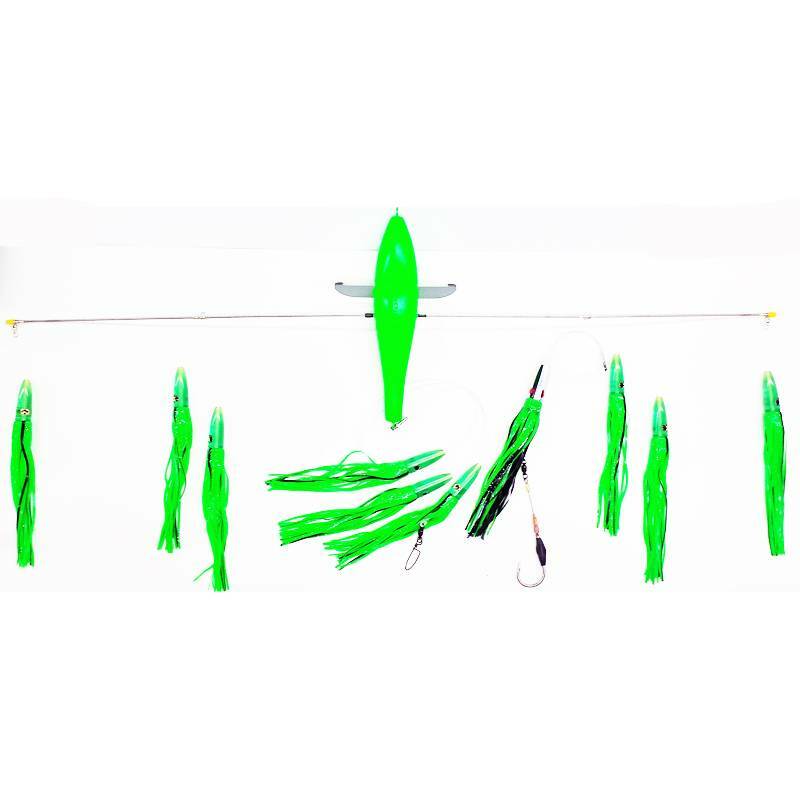 The Green Dream Splash/Bar is one of the most productive and effective spreaders out on the water today. Able to be fished from any position, when you’re near the fish, you WILL catch on this bar. 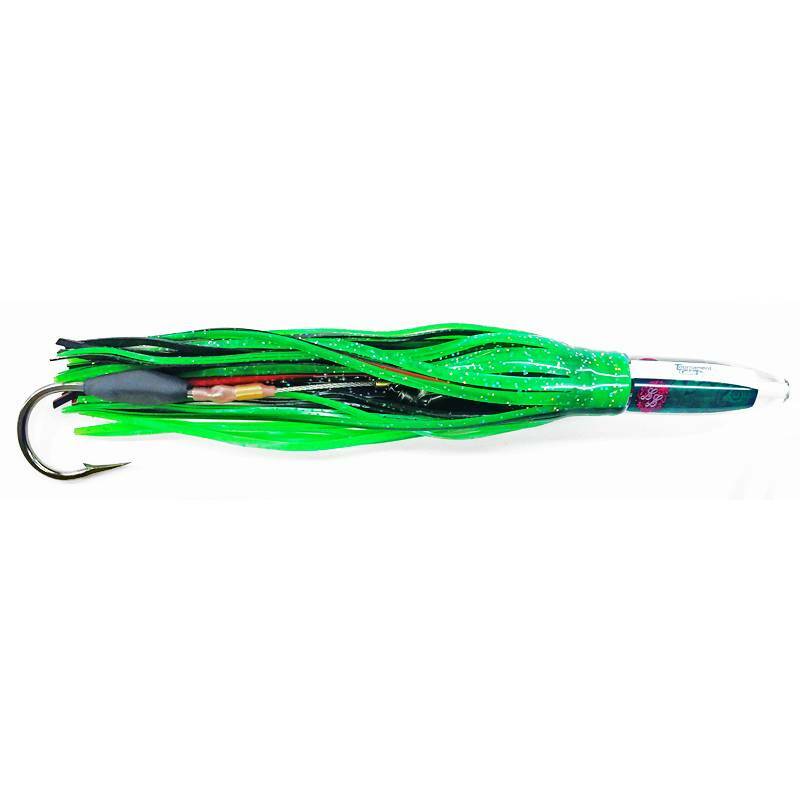 The Green Dream: A 42in Titanium Splash/Bar with a 13in Center Bird, rigged with ten 11in TC Tuna Bits and a Custom Tournament Cable Tuna Snack Lure as a Stinger. This bar simply can’t be beat. Side teaser baits are rigged with 200lb Momoi Mono, and the center line is 250lb Momoi Mono with a 250lb AFW Ball Bearing Snap Swivel for attaching the stinger (the center line also has an extra TC Tuna Bit, to keep the stinger farther back). The stinger is a custom Tournament Cable Tuna Snack Lure on a 30in 250lb Momoi Mono leader. The lure is rigged with a Quick Rig Keel Weighted Stainless Southern Tuna-style hook, 600lb cable and 350lb Ball Bearing Swivel inside the skirt. Quality from tip to tip, nose to stinger. The Tournament Cable Green Dream Splash/Bar.